The Green Pregnancy Diet: Healthy eating habits for mommy, baby and the planet is written by Radha McLean, a mother, writer and lifelong vegetarian. Essentially it is a guide to help expecting mothers to eat a healthy vegetarian diet during pregnancy, while also eliminating exposure to dangerous chemicals and toxins. It includes information on the way that an organic and vegetarian diet will improve your health as well as benefit the environment. The will help you maintain an ideal weight during pregnancy, ensuring that you and your baby are benefiting as well as the planet. The book also includes tips for creating a green kitchen and advice about nutritional supplements during pregnancy. McLean discusses the basic concepts of a “green” diet and provides readers with a vegetarian-based eating plan. Women are given the information about nutrition that they need to make choices that will adequately nourish themselves and their baby. For women who are not vegetarian and prefer not to eliminate animal products the author offers suggestions for cutting back on the amount of meat you consume, so as to improve your health and benefit the environment. The Green Pregnancy Diet describes where dangerous chemicals and toxins may be hidden in your home and gives ideas about how to eliminate these substances from your kitchen. The book also includes 20 easy recipes that are designed to be delicious while at the same time providing optimal nutrition during pregnancy. All of the recipes are friendly to the environment and include ingredients that are organic, vegetarian and whole grain, without any processed sugar or chemical additives. Vegetables, fruit, whole grains, tofu, beans, nuts, seeds, avocado. The Green Pregnancy Diet does not include exercise recommendations. 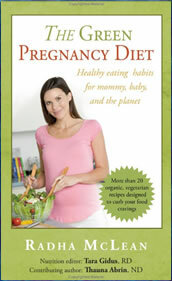 The Green Pregnancy Diet: Healthy eating habits for mommy, baby and the planet retails at $13.95. Specifically designed to meet the needs of pregnant women. Educates women how to stay healthy with a vegetarian diet during pregnancy. Encourages the intake of a variety of unprocessed and organic foods. Recipes are simple to prepare. Includes wheat, gluten and dairy free options. Reduces risk of exposure to chemicals during pregnancy. Provides advice about nutritional supplementation. Some women may prefer not to eat a vegetarian diet. Some women may experience digestive difficulties when adjusting to a higher fiber intake. Does not provide exercise guidelines. The Green Pregnancy Diet highlights the importance of a healthy vegetarian diet during pregnancy and provides women with the information they need to create a nutritionally balanced vegetarian eating plan. It will especially appeal to vegetarian women and those who are concerned about the environment because the book addresses the way that our food and lifestyle choices impact not only on our health but also the health of the planet.